Various payment options participants can use to register for events. You can also visit our office to swipe your Debit or Credit Card. Visit our office to pay cash. You can also deposit the same in near by Branch of ICICI, HDFC or Axis Bank. Send your payment to [email protected], Calculate event cost as per current US$ rates + paypal transaction fees. 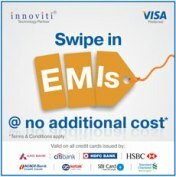 Swipe 8 top Bank's Credit Card and split your payment into 3-18 EMIs on the spot. Call on 9611102222 or Email us at [email protected] to clarify any of your doubt.